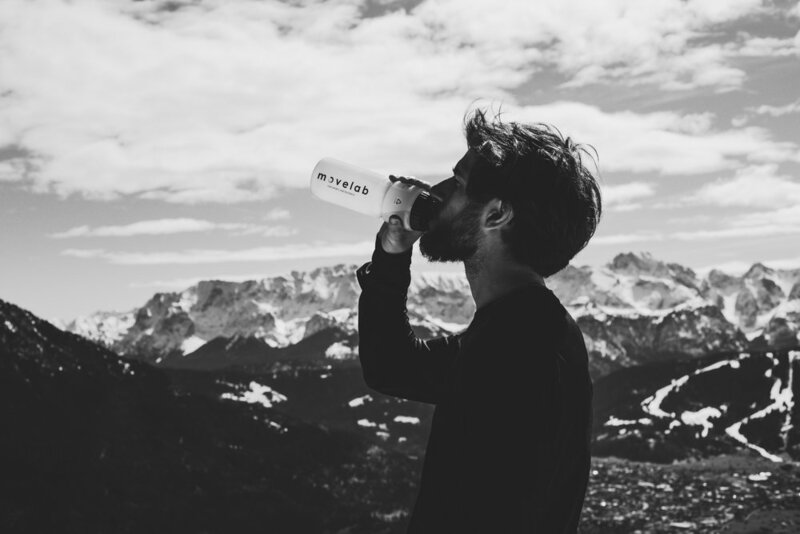 What Is Intermittent Fasting And Does It Actually Work? It's limiting calorie intake during certain hours/day or days/week. In this respect, IF is more of an eating pattern than a diet. It limits when to eat, and not so much what to eat. And that’s part of it’s appeal to people who don’t want to count calories or follow a restrictive plan. Fasting has been a practice throughout human evolution. Ancient hunter-gatherers didn't have supermarkets, refrigerators or food available year-round. Sometimes they couldn't find anything to eat. We now have unlimited access to food (including junk food), so eating several meals per day plus snacks may be less natural than fasting from time to time. The 16/8 method: This method involves skipping breakfast and restricting your daily eating period to 8 hours, such as 1–9 p.m. Most people find the 16/8 method to be the simplest, most sustainable and easiest to stick to. It’s also the most popular. There is still some controversy around whether or not intermittent fasting is right for women due to the risk of hormone imbalance. Until more concrete studies are available, it may be best to start with an intermittent fasting schedule that is less extreme. For example, women should aim for a 12 hour fasting window rather than a 15- to 16-hour window , an all-day fast or extreme low calorie days. Intermittent fasting is a weight loss trend that does work for some people. 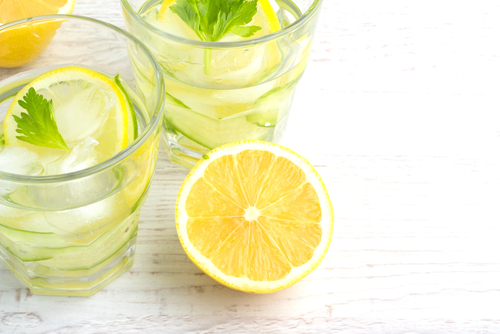 It can help to lose weight and reduce belly fat. But, it isn't healthy and safe for everyone. Many people should not try intermittent fasting because it can be risky. It can also be difficult to stick with. Doughnuts, soda, chocolate chip cookies, pecan pie, creamy puddings, cakes, candies…oh the joy of sugar! We all love to indulge in a sweet treat, and these days treats are not at all rare in the Standard American Diet. We eat sugar waaaaay to often. 100 years ago, sweets were truly a treat, and were consumed rarely or on special occasions. Generally, these treats were sweetened with raw honey, or real maple syrup…...the good stuff. 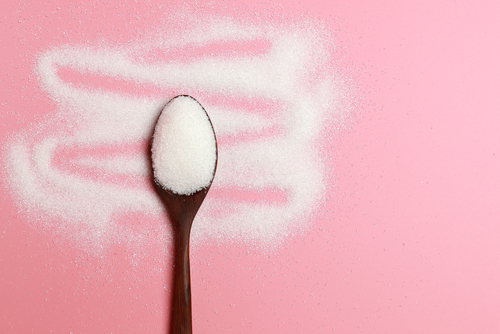 Nowadays, our sugar fix comes from highly refined sugar. This highly processed sugar is in virtually every packaged food in the grocery store, and probably lurking in all of your cupboards. It can also fly under the radar by other names - high fructose corn syrup, dextrose, fructose, glucose, maltodextrin, maltose…just to name a few. A 12-ounce can of regular Coke contains 39 grams of total sugar, which is about 9 1/3 teaspoons of sugar. If you’re reading the ingredients list though, you won’t see sugar clearly listed. Coke in the United States is made with high fructose corn syrup as a lower-cost sugar alternative. High fructose corn syrup is actually the second ingredient in Coke, behind carbonated water. These are just 10 of the 124 known diseases and imbalances connected with sugar. Yikes! Not only do we need to worry about processed sugar, but we also need to be watchful of artificial sweeteners; Aspartame, sucralose, cyclamate, acesulfame potassium…these are definite NO-NO’S! The fact that they are called ARTIFICIAL says it all. Do we really want to expose your body to these unnatural chemicals? NO WAY! These artificial substances are known neurotoxins. What this means is that they can actually alter brain chemistry and specifically act on nerve cells. Avoid these at all costs. Even though we may be consuming small amounts of these artificial substances, consuming them on a daily basis, day after day, adds up to quite a bit over the years! To sweeten a cup of hot tea or a smoothie, try a few drops of stevia in liquid form. I also love using maple syrup and raw honey as sugar alternatives. Of course, the best sweet fix of all is FRUIT! Fruit is nature’s candy. Aside from being sweet, fruit is loaded fiber, vitamins, antioxidants and lots of supportive nutrients. So ditch the sugar, and eat more fruit to fix your sweet tooth. Complete with daily emails and guided support every step of the way. NOTE: Iodine-deficiency is not very common in the developed world, so supplements are likely not necessary, and may exacerbate certain thyroid issues. Check with your healthcare professional before taking supplements, and always read the label. Iodine - Iodine is naturally found in fish and seafood. Other foods that contain iodine are navy beans, potatoes, and eggs. Sometimes levels of natural iodine depend on the amount of iodine in the soil. Iodine is also added (i.e., fortified) to some foods. Seaweeds—like kelp, dulse, and nori—are packed full of iodine for your body to transform into hormones. They also usually contain a lot of other beneficial nutrients, like calcium, potassium, and Vitamins A through E, so the stuff is truly the superfood you’re missing out on. NOTE:: During pregnancy and breastfeeding iodine requirements increase by up to 60%, so pay attention to eat enough iodine-containing foods. Selenium - There is evidence that selenium (another essential mineral) can support the thyroid. A recent review of several clinical studies showed that there is not enough evidence to recommend selenium supplements to people with certain thyroid conditions. Because of this, it’s best to stick with selenium-rich foods like Brazil nuts, mushrooms, meat, and fish. 1-2 Brazil Nuts packs enough selenium to meet your recommended daily allowance. Protein - One of the common symptoms of thyroid issues is the inability to lose weight. If this is the case, one thing you can eat more of is protein. Protein has a "thermogenic effect" because your body has to spend energy metabolizing protein; this means that protein has a metabolism raising effect. Go Gluten-free - There is evidence of a link between underactive thyroid and gluten sensitivity. There may be a "cross-reactivity" where the immune cells that are sensitized to gluten can attack the thyroid cells by mistake; this is essentially how autoimmunity works and can affect more than just your thyroid. You might request getting tested for celiac disease if you are experiencing thyroid issues. Avoid Triclosan - Triclosan is a common ingredient in many soaps and body washes, but it may have an adverse effect on your thyroid. A study published in Aquatic Toxicology in 2006 showed that even minor exposure to the chemical can affect how your thyroid releases hormones. Luckily, In December of 2017, the FDA issued a ruling banning over-the-counter products containing triclosan. Take Up Yoga - A study in Yoga Mimamsa found that doing certain yoga poses can help your thyroid hormone release functions. During your next routine, try incorporating poses like boat pose, bridge, and king pigeon pose. These poses help to open up throat circulation and improve energy flow around the thyroid. Lifestyle upgrades - Weight gain and difficulty losing weight are very common when it comes to thyroid issues. To maintain a healthy weight, it’s important to get enough regular exercise, enough quality sleep, and reduce stress. I’m Starting my day off right this morning with this Superfood Smoothie. Superfoods like Maca Root and Ashwagandha are dense with nutrients and have powerful health benefits. Maca Root has been shown to promote hormone balance, reduce menopausal symptoms, boost energy, and increase stamina in athletes. Ashwagandha is best know for its ability to reduce stress and inflammation. Combine all ingredients in a blender to combine. Hand washing and overall healthy habits can reduce your risk of getting sick in the first place. And good nutrition can help your immune system fight off a cold quicker. Imagine your germ-fighting immune cells all hungry and tired, versus them being nourished and full of energy. Wash your hands. A lot. Your hands can trap and transport all kinds of microbes that cause sickness. And I’m not just talking about colds here, but lots of different germs. NOTE: Antibacterial soaps and gels are not recommended! Not only is it no more effective than regular soap and water, but it can contribute to antibiotic resistance. Get enough nutrients. I know this is way oversimplified, but I would be remiss to exclude it. Every cell in your body, including your immune cells, need enough of all the essential nutrients. The more nutrition you have, the better and stronger you will be, especially with vitamins A, C, and E. Vitamin A-rich foods include carrots, sweet potato, and organ meats. Vitamin C-rich foods include bell peppers and citrus. Vitamin E-rich foods include nuts, seeds, and leafy greens. Take a probiotic daily, and eat probiotic foods. Helping our health-promoting gut microbes with more of their probiotic friends is in order here to help keep the immune system strong. Try 1-2 servings/day of fermented foods and drinks like sauerkraut, kimchi, miso, kefir, and kombucha. Eat garlic. Mince two cloves and let them sit for 15 minutes for the active compounds to develop. Mix with olive oil and salt and spread on toast. Take zinc to shorten your cold by as many as 3 days. Pop vitamin C. It won’t prevent colds unless your are deficient, but it can shorten your cold and reduce symptoms. Add glutathione. Master antioxidant glutathione strengthens the immune system and makes vitamin C work harder. Take a supplement or get from a high-quality whey protein. Supplement with curcumin. Turmeric’s active compound reduces inflammation to relieve congestion. Sip bone broth to bolster the immune system and take the edge off your cold symptoms. Add ginger, garlic and turmeric for extra cold-busting oomph. Take a detox bath. Add epsom salts and essential oils to your tub to soothe symptoms and draw out impurities. Don’t forget vitamin D. Vitamin D keeps your immune system in fighting shape. Use a nasal rinse. A saline spray or neti pot gets everything moving and kills the bugs in its path. Click here to purchase any of these immune boosting supplements. There are lots of things we can do to stay healthy and reduce infections naturally. Washing your hands is a proven way to reduce your risk. And staying healthy in all other ways helps a lot. Getting enough nutrition, eating probiotic foods, and getting enough sleep are key year round. Along with many other essential vitamins & minerals, the ginger, garlic, honey and capsaisin in this tea are all good for stimulating metabolism, boosting immunity and cleansing the respiratory tract. In a sauce pan or tea pot, mix ginger, garlic, lemon or lemongrass, cayenne or paprika, and mint leaves. Add boiling water. Let steep for 5 minutes and sweeten with honey. Enjoy! Leaky gut, also known as increased intestinal permeability, is a digestive condition in which bacteria and toxins are able to "leak" through the intestinal wall. "Leaky gut" is a popular topic in the health and wellness world these days. It's been suggested that it might be the cause of many symptoms and conditions that seem to be all-too-common. Allergies, intolerances, joint pain, bloating, digestive issues and even autoimmune diseases to name a few. But what is leaky gut, and how can you tell if you have it? We’ll dig into the details below. FACT: About 70-80% of our immune system is housed around our gut, so it’s ready for foreign invaders. Herbs and spices as desired: 1 bunch of parsley, 1 tablespoon or more of sea salt, 1 teaspoon peppercorns, additional herbs or spices to taste. I also add 2 cloves of garlic for the last 30 minutes of cooking. 5 - Add spinach and garlic 30 minutes before serving. Turmeric is a rhizome that grows under the ground like ginger. It has a rich, bright orange color and is used in many foods. Originally used in Southeast Asia, it’s a vital component for traditional curries. You can find dried powdered turmeric in the spice aisle of just about any grocery store. Sometimes they carry the fresh rhizome too (it looks like ginger root, but smaller and orange). 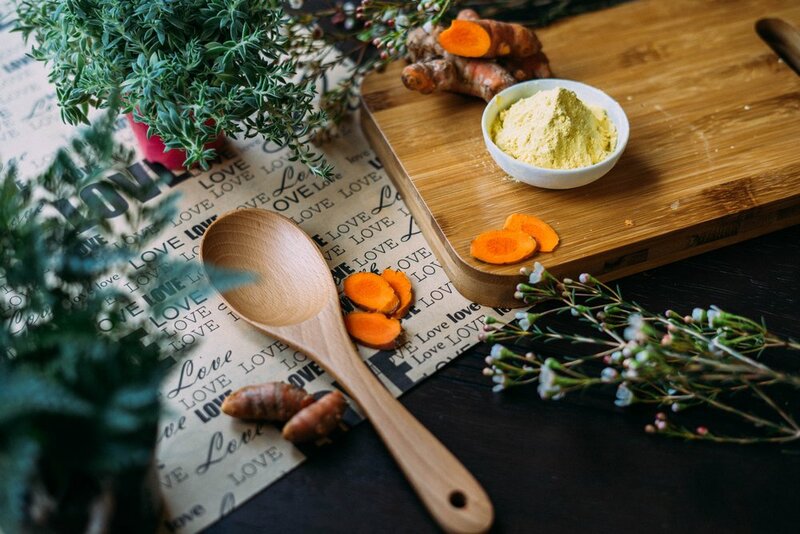 Turmeric contains an amazing anti-inflammatory, antioxidant compound called "curcumin.” The amount of this bioactive compound is around 3-7% by weight of turmeric. Curcumin has been studied like crazy for its health benefits. Many of these studies test curcumin at up to 100x more than that of a traditional diet that includes turmeric. Curcumin supplements can be great for your health, but they're not for everyone. Check the label or speak with your practitioner before taking it. Try my version of “golden milk,” and let me know how you like it in the comments below. Pour into a mug & enjoy! Multivitamins are exactly what they sound like: multiple vitamins. They're supplements that contain several different vitamins in each one. They can also contain minerals and other ingredients like amino acids or fatty acids. And because there are multiple ingredients, there usually provide a very low dose of each ingredient. There are 13 vitamins and at least 16 minerals that are essential to health. You need certain amounts of all of these nutrients for optimal health. In fact, nutrient deficiencies can impact immunity, reproduction, growth, hormone balance and many other important processes in your body. You may have heard or read on the internet that if you follow a "balanced diet," you'll definitely get enough vitamins and minerals. But the truth is, many people in the US are nutrient deficient. So the evidence is clear that multivitamins aren’t a magical “good health and vitality pills” They’re not guaranteed to improve your mental or physical health, or help you live longer; but, they do have some health benefits. Super high doses of some nutrients can be harmful, but multivitamins are safe for most people. Unless you have a knowledgeable practitioner advise otherwise, you want to stick to the dose on the label. However, it is not uncommon for some supplements to have been tested and found to contain different ingredients than what's on the label. Sometimes they contain ingredients that are not good for your healthy. Choosing supplements that are from reputable companies is so important. When shopping for supplements, there are a few things you can keep an eye out for to help ensure that your supplements are free of synthetic additives. Research ingredients that are banned in Europe, since they have stricter food regulation laws there. Buy non-GMO, organic and vegan where possible or necessary. Buy pure whenever possible – bulk powders, pure liquids and capsules (rather than tablets) are less likely to contain harmful ingredients. Have a conversation! Any solid business – whether it’s the supplier or the actual manufacturer – should be happy to answer your questions. Be extra careful when buying “cheap” products online – if something is unusually inexpensive, it probably means it just has less of the actual substance in the package to begin with. Multivitamins are not a short cut to optimal health. There is limited evidence that they improve health for most people. But there are some benefits. Of course, taking a multivitamin is not going to overcome the negative effects of a poor diet. I always recommend eating a balanced diet of whole foods with lots of nutrients coming from complex carbohydrates, protein, and fat. Check out my Superfood Salad recipe below! It is chockful of nutritional goodness! When the temperature drops and it begins to get darker earlier, our bodies start to crave warm comfort food. It makes sense then that a hearty soup is such a satisfying meal in the fall, as it soothes both the body and the mind. With fall comes a bounty of produce, like butternut squash, that make the perfect soup ingredients. Butternut squash is a virtual storehouse of nutrients. Unlike summer squash (zucchini, crooknecks, pattypans), winter squash has had a lot more time to develop and pump itself full of vitamins and minerals throughout its lengthy life on the stem. We’re talking oodles more vitamin A (in the form of beta-carotene), vitamin C, manganese, potassium, and even some extra dietary fiber thrown in. And while this may sound like an over simplification, more and more research shows that our gut (digestive system) has a bigger role in many diseases than we used to think. And we're not just talking about heartburn, constipation, diarrhea, IBS, IBD, etc. We're talking about all kinds of issues like allergies, pain, mood disorders, and nutrient deficiencies. For best results you will need Fermenting Jars or "fermenting weights", to keep the carrots submerged in the brine. When it comes to healthy skin, what you eat really matters. In addition to staying hydrated, using safe skincare products and wearing sunscreen, make sure you get plenty of these foods in your diet for glowing, healthy skin. Probiotics do more than just heal your gut, they boost the production of ceramides (healthy fats in skin) and aid recovery from exposure to UV rays. Among berries, these have some of the highest amounts of antioxidants, giving protection against free-radical damage from pollution and the sun. Keep a stash of frozen blueberries in your freezer so they're ready to go into a smoothie. A high concentration of vitamin E (a powerful antioxidant) helps skin stay smooth and plump. Sprinkle chopped walnuts on lunchtime salads or your morning cereal. See recipe for walnut vinaigrette below. Natural sweeteners are much better for skin than refined sugar or artificial sweetners. The latter can also cause hormonal imbalances, leading to inflammation. Honey is an especially sweet choice because it's antibacterial and anti-inflammatory. Simply put, the darker the green, the better. Kale is packed with vitamins (A, B, C and K) and beta carotene, which increases cell turnover, tightens and detoxifies. Make a kale salad, saute it with garlic or roast it to make kale chips. Omega-3 fatty acids reduce inflammation. They also help create a strong, protective skin barrier. Use avocado on toast or make a guacamole for a dip with crudité. 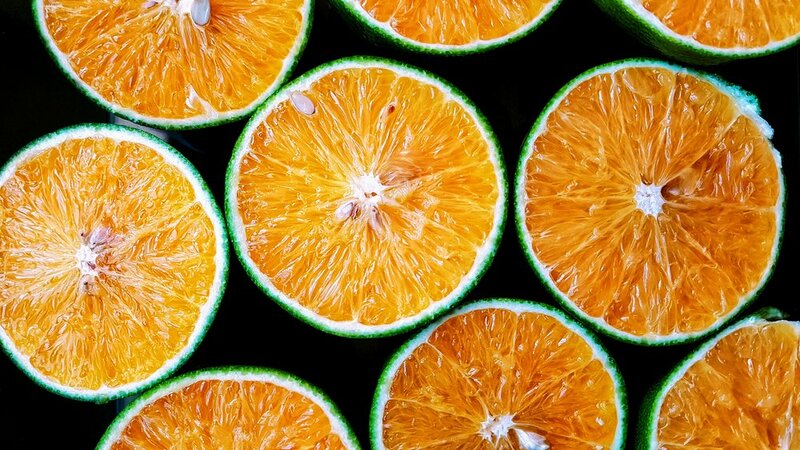 Anything with vitamin C is very beneficial to the skin It reduces dark spots, helps with collagen production and brightens overall skin tone. The enzymes smooth out imperfections to deliver a luminous and the seeds are a good source of zinc. Add canned pumpkin to a smoothie or oatmeal for an instant dose of this healthy food. Chocolate for your skin? Yes, really, as long as it's dark (70 percent cacao or higher). The polyphenols repair damaged skin and restore elasticity. Beauty Tip: Make a superfood salad with a base of green leafy veggies every day. Add kale leaves, avocado, pumpkin seeds, blueberries and a healthy drizzle of this walnut vinaigrette to "beautify" your salad! So, let's talk about how much of this critical fat-soluble vitamin we need, and how you can get enough. The three ways to vitamin D are exposure to the sun, consuming vitamin D containing food, and through supplements. Your skin makes vitamin D when it's exposed to the sun; that's why it's referred to as the "sunshine vitamin. "How much vitamin D your skin makes depends on many things. Location, season, clouds, clothing, all affect the amount of vitamin D your skin can produce from the sun. One standard recommendation is to get about 20 minutes of sun exposure between 10:00 a.m. - 3:00 p.m. to the face, arms, legs, or back. This should be done without sunscreen, at least twice a week.Of course, we should always avoid sunburns and of course in some locations (and seasons of the year) it's not easy to get sun exposure. So, how can we get enough vitamin D in other ways? Taking a supplement or take some cod liver oil (which also contains vitamin A) is an easy way to ensure that you get the minimum amount of vitamin D, plus a bit extra. But before you take vitamin D containing supplements, make sure you check that it won't interact with other supplements or medications you may be taking. Always read labels, and ask a healthcare professional for advice. The maximum amount recommended (for the general population) is 4,000 IU/day. Too much vitamin D can raise your blood levels of calcium (to an unsafe level), and this can affect your heart and kidneys, but overdosing is rare. The best thing, if you're concerned, is to ask your healthcare professional to do a blood test and make a recommendation about how much vitamin in supplement form is right for you. You may need to take a higher dose for a short period of time to get your levels up to a healthy range. I've given you some ideas how you can get the minimum 400-600 IU or vitamin D daily. Preheat the oven to 400. Place parchment paper on a baking sheet and place fish on top, skin-side down. Surround with a single layer of asparagus. Bake for 20-30 minutes until fish flakes easily with a fork. Blood sugar levels play an important role in how we feel and if we will be at risk of developing certain chronic problems such as obesity, heart disease and diabetes. What to eat before and after a workout – this is a question that I get asked a lot! Good pre and post workout nutrition is key for optimal performance during exercise and for providing your body with the fuel to repair and strengthen muscles after a workout. Proper nutrition also ensures that you are getting in all of the essential nutrients that your body needs for overall health, energy and injury prevention. In the blender: 1 cup coconut water with 2 tablespoons cacao powder 2 tablespoons hemp seeds and a small banana. Take 1 cup mixed fruits (oranges, grapefruit, berries, melon or whatever is fresh and in season) and top with 1 tablespoons ground flax seeds. Lettuce turkey wrap. Sliced deli turkey wrapped in butter lettuce. Want to lose weight, get healthy, and have more energy? Sign up for my newsletter and get weekly tips, tricks, and support from me! 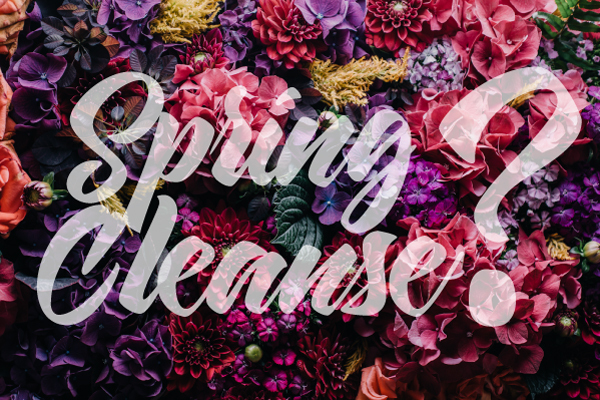 Is A Spring Cleanse Right For You? I’ve gotten a lot of questions about cleansing and detoxing throughout the years; What are the benefits? How does it work? Is it healthy? Toxins enter our bodies every day through food, water, air, cleaning products, soap and skin care products just to name a few. Everything you eat, drink, and absorb into your body (through your skin) is broken down by your liver, purified in the kidneys, and eliminated through your digestive system and skin (with sweat). If this miraculous cleansing system becomes sluggish and over worked, our bodies can not break down and utilize all of the powerful vitamins, minerals and nutrients we need to feel amazing, optimize energy levels, and maintain a youthful, radiant glow! I do not promote juice-only fasts. However, I do see the value of a Whole Foods Cleanse - Giving the digestive system a break by eliminating foods that cause inflammation in the body. In other words, the goal of a Whole Foods Cleanse is not a week of starvation! The goal is to simply clean up the diet and eat as well as possible, (bye-bye lattes for a few days!) It is a powerful kick start towards positive and lasting change for your health and your body. No gluten, dairy, soy, alcohol, processed foods, added sugar, while cleansing. Reduce coffee to run cup a day. While this may sound like a lot to let go of at first glance, the results will be worth it; The lightness and energy you’ve been longing for, weight loss, glowing skin and finally experiencing what it feels like to live in a clean body. The greatest thing about a Whole Foods Cleanse is the ability to enjoy nutritious meals, soups, juices and smoothies while not starving the body or giving up food completely. If you are interested in a guided, supported cleanse this spring.....Check out my 10 Day Total Body Reset Detox. Menu plans, recipes, shopping list and health coaching from me are included! 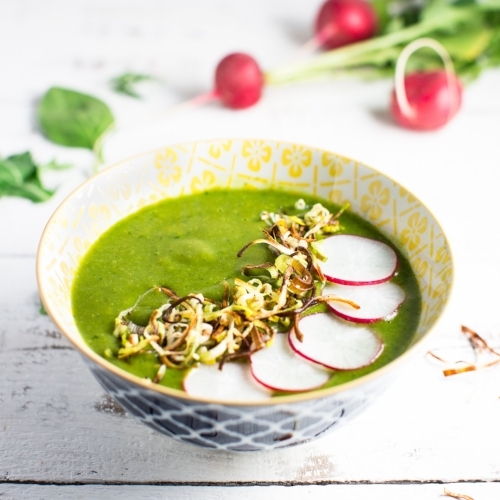 This soup from one of my favorite cookbooks, Deliciously Ella, will be entering my regular recipe rotation as it’s fresh and light taste is perfect for summer! It calls only 4 ingredients and is extremely easy to make. Healthy, tasty and easy – it’s everything I love in a dish! Why I love this: Peas contain a wide variety of vitamins and minerals including vitamins C and K, and several B vitamins, plus manganese, phosphorus, and protein. This makes them an excellent anti-inflammatory food. Mint contains an antioxidant called rosmarinic acid, which can relieve seasonal allergy symptoms, the menthol it contains is a natural decongestant, and it can also soothe an upset stomach.